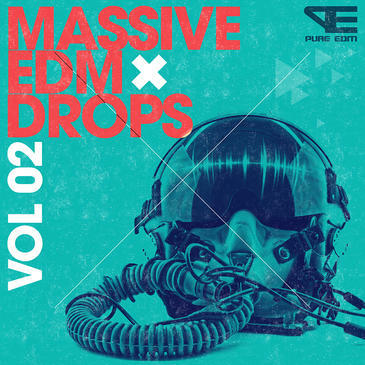 ‘Massive EDM Drops Vol 2’ reignites this series of dancefloor-shaking songstarters from Pure EDM, bursting out of the blocks with 25 micro Construction Kits designed to get your next track up and running. These hard-hitting basslines, drop synths and quintessential drums are inspired by elite production talents like VINAI, Showtek, W&W and Hardwell. Within this pack you’ll find 25 micro Construction Kits including all the drum and percussive elements heard in the main Kit demos, leads and synth drops. Each of these powerful drum and lead synth combos could easily form the backbone of your next EDM smash hit and with the included MIDI data you can customise them to perfectly suit your production. Pure EDM is an exciting new label from Producer Loops, designed to bring you the very best content for your productions. Pure EDM products perfectly capture the Big Room sound, bringing you stunning production quality and only the most current & essential EDM loops. ‘Massive EDM Drops Vol 2’ includes MIDI files for every lead and synth heard in each Kit, allowing you to seamlessly mix your favourite synths and samplers with the sounds contained in the pack. While the supplied ACID/WAV content is extremely flexible and powerful, MIDI has the added benefit of allowing you to go to extremes of pitch and tempo beyond which the loops were originally recorded, with no time stretching or pitch shifting artefacts. Furthermore, you can make tweaks to the riffs so they fit perfectly into your existing mixes. For users looking to simply drag and drop, the ‘wet’ files contain all of the effects processing heard in the audio demos. But for producers looking to create their own effects mix, ‘dry’ loops are also included. Don’t like the wet loops? No problem, add your own effects.